They were a much-needed addition to the genre known as noise-pop, a category of alternative/indie rock developed in the mid 80s, its musicians favoring heavy distortion and feedback supporting a strong melodic line and pop production. 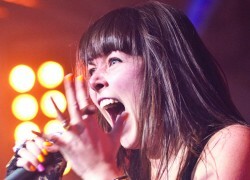 When I heard the news that Sleigh Bells would be releasing a follow up, I was thrilled. Upon hearing the album itself, I was less so. There are many moments on “Reign of Terror” that hint at potential greatness, but then fail to actualize. The production quality as a whole seems less rhythmically centered than their previous album, instead favoring the keyboard and guitar sounds. Crunchy, simple guitar riffs were a large part of the first record’s appeal, and while they can still be found here, something is different. During production, the volume on the first record was pushed past the point of blowout, giving it a uniquely pulverizing quality. The guitars on “Reign of Terror” still sound “metal,” albeit less intense. The drum machine now favors an almost 80s New Wave sound quality, over the marching band style intensity incorporated previously. There are a few standout tracks, but none stood out to me as being the clearly supreme song. “Born To Lose” has a simple yet effective riff that carries the song along satisfactorily. “Leader of the Pack” and “Comeback Kid” call to mind pop music from the early 60s, with a jagged modern edge. “You Lost Me” slows down the tempo and creates a hazy atmosphere in which the guitars sound like a train rolling through the night. However, the rest of the album’s tracks are mostly forgettable. There’s nothing particularly atrocious, but nothing I felt was worthy of revisiting either. While it might not be fair to compare this record to its predecessors, it is not possible to avoid these comparisons. Overall, this record is average, and suffers greatly from following such a cohesive, raucous debut. I would give this album a B-, or three out of five stars. It is nice to see a fellow Floridian doing well … even if it is not my particular type of music.